Huge quantities of steelwork and vast amounts of earthmoving are involved in the creation of one of the UK’s first inland ports, which will offer half a million square metres of development plots for storage and distribution warehouses. 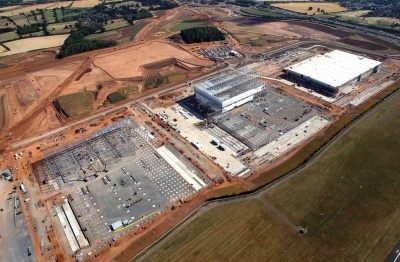 A game-changing distribution hub (inland port) known as the East Midlands Gateway is under construction in Leicestershire. Covering 700 acres, the site combines links to the M1 and East Midlands Airport with a major new rail freight terminal. To facilitate this grand scheme, project developers Roxhill and SEGRO have also funded £100M of infrastructure, including a 50-acre rail terminal and extensive road improvements, designed to give the best possible connectivity to the 10 plots that will be available to occupiers. East Midlands Gateway is located close to the very centre of England, with Nottingham 13 miles to the north-east, Leicester 20 miles to the south and Derby 14 miles to the north west. This is said to give it a strong, three city labour supply with one million people within a 30-minute drive, and 332,000 typical logistics employees within a 30-minute drive. The rail freight hub links directly to the Castle Donington freight line, which provides access to major UK ports such as Southampton, Felixstowe and London Gateway. Main contractor Winvic is undertaking a huge earthmoving operation to prepare the ground for the planned structures. This involves over half a million cubic metres of plateau, screening and topsoiling, with a plant fleet of 65 vehicles moving approximately 105,000m3 of earth every week. Four of the site’s planned steel-framed distribution centres are currently being constructed by Winvic. Severfield is fabricating, supplying and erecting steelwork for three plots, while a fourth is being done by Caunton Engineering (see below). The three plots being erected by Severfield are all very large portal-framed structures with their own office blocks. Plot One, being built for an online retailer, requires 2,000t of structural steelwork for the main frame and then a further 4,500t for the building’s two internal mezzanine levels. The structure is the largest of the four under construction and measures just over 250m-long × 151m-wide and internally it consists of eight 31.6m spans. The structure also has an externally attached single storey office block running along one of its shorter elevations. Plot Two, is the highest of the structures, reaching a maximum height of 35m for approximately one third of its overall length. The remainder of this building is 19m-high. Completed in a six-week programme, the building’s frame covers an area of 55,741m2 and required almost 2,500t of structural steelwork. Plot Two has seven spans, three in the high-bay section (measuring 29.8m, 35.8m and 42.7m) and four in the lower part (measuring 27m, 2 × 35m and 45m). Situated along one corner, Plot Two has a 36.9m wide three-storey attached office. Unlike the offices in the other units, this one is not a solid structure as at ground floor level there is a 15m opening to let HGVs pass underneath. Beyond this opening, part of the office is cantilevered and in its final condition is supported by three pairs of forked feature columns. The 9m cantilevered floor beams had to be temporarily supported using 7m-high trestles during the erection. They were removed using a jacking system, once the steelwork was complete, to transfer the loads to the feature columns. The third plot is the smallest of three Severfield distribution centres (46,451m2) and will be occupied by another online retailer. Up to 20m-high, the portal-framed structure requires 2,300t of steel. 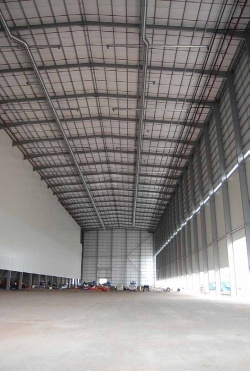 It consists of five spans, measuring 37.2m each and also has a two-storey office block attached to one gable end. 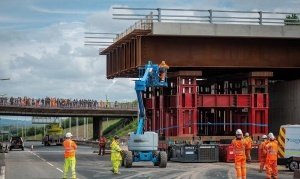 One of the major infrastructure works that has been undertaken around the East Midlands Gateway project is a new bridge across the M1, which will join the A6 Kegworth Bypass to the A453 to serve the distribution park. 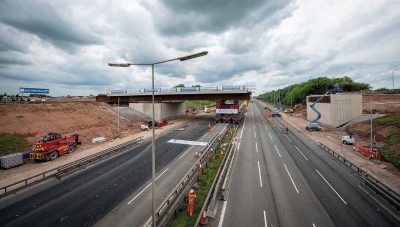 Working on behalf of main contractor Buckingham Group, and to a design by structural engineer Cass Hayward, Cleveland Bridge fabricated, delivered, assembled and installed the bridge over one of the UK’s busiest motorways. The bridge was delivered to site in four sets of braced girders, fabricated from weathering steel. The bridge span is approximately 50m, and the completed steel structure weighed approximately 330t. However, with the concrete deck added, the total bridge weighed close to 1,250t. The girders were assembled adjacent to the M1 motorway. The concrete deck was then cast by Buckingham Group onto the steel girders and, once sufficiently cured, the central supports were de-propped to allow the bridge to settle, prior to launching. The proximity of the airport meant that large cranes were effectively prohibited for the installation process. Consequently, Cleveland Bridge used Self Propelled Mobile Transporters (SPMTs) to offload the 50m-long braced girder pairs from the delivery vehicles. These girder pairs were lifted and transported onto temporary supports, designed by Cleveland Bridge, in a secure area adjacent to the M1. The girder pairs were then bolted together and handed over to Buckingham Group to cast the full-width concrete deck. Casting the concrete prior to launching the bridge minimised the need for extensive works once the bridge was in place. When the concrete had cured, Cleveland Bridge returned to site to install the entire bridge during a weekend closure of the M1 – limiting disruption to road users. A fleet of SPMTs was the preferred option to launch the structure into the final position. They lifted and manoeuvred the structure into place and then lowered it on to the abutments. “We were extremely happy with the quality of the product supplied by Cleveland Bridge. They worked to a challenging programme and collaborated well throughout the project,” says Buckingham Group Project Manager David Lane. Working on a design and build contract, Caunton Engineering has fabricated, supplied and erected 900t of hot and cold rolled steelwork for Plot Four at the East Midlands Gateway. Measuring 244m × 69m and reaching a height of 12m, the unit will offer just over 16,000m2 of floorspace. This portal-framed structure will be occupied by Swiss-based transport and logistics company Kuehne + Nagel. It will include a 3,700m2. Temperature-controlled area to accommodate the company’s growth plans within the pharmaceutical sector. As the centrally-positioned spine beam has longer spans to bridge over, the member size changes in order to take into account the bigger loadings that are encountered on the top of each column. Thicker plate sections, measuring 400mm-wide and 8.5m-long, are positioned over the columns and these are then spliced to narrower 17m-long members that span between the columns. Supporting the spine beam is a series of plate girder columns each weighing 5t. As well as designing and erecting the main frame, Caunton has also installed precast stairs within an attached three-storey office block, which is positioned along one of the gable ends, a pre-cast lift shaft and a walkway that connects the main office to a smaller hub office. The office block has a composite beam and column design, with internal clear spans of up to 10m. Caunton has subcontracted Structural Metal Decks (SMD) to install the steel decking.